The Birds Hostel, Londyn, Anglia : Rezerwuj teraz! The guest can cancel free of charge until 1 day before arrival. The guest will be charged the total price if they cancel within 1 day before arrival. If the guest doesn’t show up they will be charged the total price. •Every guest must present valid, government-issued photo ID when checking in. Foreign nationals must have an EU Identity Card or passport. We have a strict policy: No ID, No Stay, with no exceptions. •ALL guests must be 18 or over. •Free fast Wi-Fi throughout the building. •Large common area with chairs/tables and bar to hangout ( T&C apply) •Free luggage storage and safety deposit boxes available for hire. •Clean, crisp linen and if you need towels we have them for hire. •CCTV in all common areas. •Hire padlocks and adaptors available. •We have a pub kitchen that serves amazing food daily from 11 am to 10 pm. 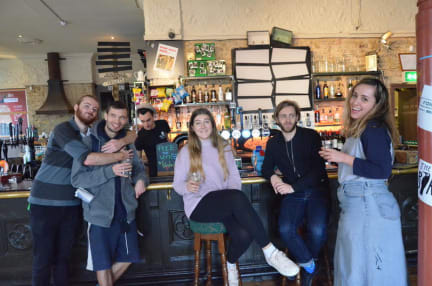 Just a few minutes walk from the Central line, The Birds Hostel gives you the community of East London with the accessibly of the whole of the city. Despite the quiet, leafy feel of Leytonstone, you can be in Oxford Circus within 30 minutes, shopping your heart out. Why pay central London prices when you can be in the heart of the city so quickly? Explore the tourist spots and head back to a community of real Londoners to recharge. Enjoy a good night’s sleep in our always-crisp white linen and be ready explore in the morning – after a delicious continental breakfast to set you up on your way. Food is very important to The Birds, with a highly regarded menu of vegan and meat dishes served in the friendly, craft beer-focused pub below. It’s a menu that’s picked up lots of praise this year from food reviewers and bloggers. And with a 20% discount on food and drink for all residents, you can try all the London craft beers that are becoming world famous in the amazing décor inspired by local boy Alfred Hitchcock. Also crucial is security, with is why we have installed the latest key card system that means that you won’t have any surprise visitors and you can come and go any time of the day or night. We also have lockers which you can use your own padlock or hire one. Also available are larger lockers (covered by CCTV) for rent at £2 a day, giving you the confidence to get out and enjoy London. We offer 6 or 9 beds mixed dormitory rooms, whereas 1 room is female only dormitory. Secure Lockers for rent, covered by 24/7 CCTV. A £5 deposit is taken on arrival for the door access card for the building and your room. Deposit is returned on receipt on the card on check out. Cancellation policy: 24h before arrival. Payment may be taken on booking, before arrival. Guests must be over 18 years old. Very crowded rooms but nice atmosphere and a unique pub. Tasty breakfast and quiet at night. On the website I found out about the laundry service , but there was nothing like that in the hostel. And the music in the pub of the hostel is much too loud in the night during the weekend, what makes sleep impossible. There are no bedside lamps and the distance between down and upper bed is too small. The rest of conditions are very fine, everything is clean, there is good heating system and nice modern shower.